Last week we featured the music of Mario Frangoulis.This week we will feature the music of Melina Aslanidou (both pictured here). 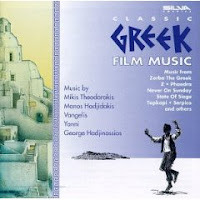 We have also been listening to a few pieces from an old CD of mine, Classic Greek film music. The facebook page for Mario Frangoulis is here. The facebook page for Melina Aslanidou is here.